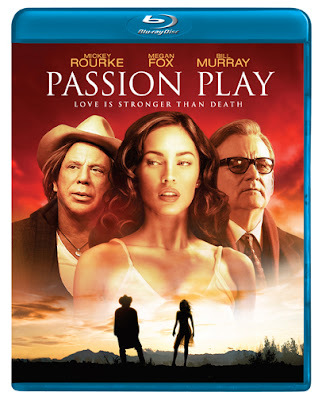 After Passion Play ’s cowardly hero Nate (Mickey Rourke) manages to walk away from the one-way drive he was taken on for shagging the devil’s wife, the ex smack-addicted trumpeter figuratively pimps out a feather-winged angel (Megan Fox) without her consent, making a deal with the devil (Bill Murray) in exchange for his life. Although it represents the stuff that twenty years of writer/director Mitch Glazer’s dreams were made of from concept to celluloid as a personal passion project, there’s no dreaming away the reality that whether you watch it in the moonlight or the harsh light of day, it’s a downbeat and altogether dispassionate production populated by unlikable characters and an even less likable plotline. Famously infamous for driving some critics out of their seats in its rough cut premiere at the Toronto International Film Festival, the nonsensical final cut of Glazer’s shoddily constructed, self-consciously pretentious Passion Play fares no better in this washed out Blu-ray presentation. Furthermore it wastes the considerable talents of Wong Kar-wai and Christopher Nolan cinematographer Christopher Doyle along with inventive Married Life composer Dickon Hinchliffe. Misanthropic – not to mention slightly biblically misogynistic – although it initially attempts to play by genre rules, Passion Play is too one dimensionally transparent to succeed as a religiously allegorical Film Noir nor artistically creative enough to operate on the level of soulful surrealism regardless of how much overt spiritual symbolism Glazer hides in plain sight from one preposterous sequence to the next. What begins as a Noirish twist on Faustian redemption turns into a lukewarm love triangle with all the heat of an ice cube – something that Fox’s fans probably never imagined was possible before she was paired up with Rourke’s toothpick chewing trumpeter whose favorite expression is “Goddamn” as well as Murray’s ironically named hapless devil Happy who builds her a place called Heaven on Earth. Relegating Murray’s Charlie’s Angels co-star Kelly Lynch to the sidelines, which isn’t that hard considering that her lifeless character is routinely upstaged by the scenery – all in all and far from being the second coming, Passion Play is proof that it takes more than quirky dreams and A-list actors to build a movie worth coming to see in the first place. I only hope that Glazer’s dream movie looked better in his dreamscape than this one does on Blu-ray/DVD.